Mix 6grams (1scoop) in 200mls of water or juice once or twice daily. Alternatively, sprinkle on to cereal, blend into yoghurt or smoothie or add to protein shakes. 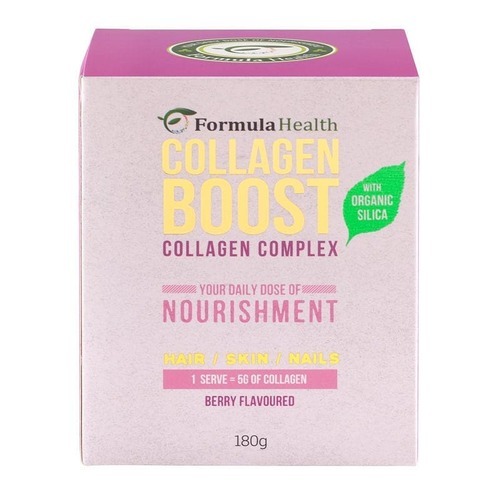 Collagen Boost contains Marine Collagen (5000mg), Orgen-Si (330mg: equiv.to 250mg of Organic silica), Organic Beetroot Powder (330mg). Other ingredients: Natural Berry Flavour, Organic Stevia. Collagen Boost is enriched with Orgen-Si, a Certified Organic source of Silica. This essential building block of collagen, combined with the properties of Marine Collagen, is what makes Collagen Boost the most advanced anti - aging product on the market. The skin on the right hand side shows aging skin that has less collagen fibres. Beauty Boost provides the essential building blocks that contribute to the maintenance of healthy and younger looking skin. Serving Instructions: Mix 6g (1 scoop) in 200-300ml of water or juice once or twice daily. Alternatively, sprinkle onto cereal, blend into yoghurt or smoothie or add to protein shakes. Collagen Boost is Dairy Free, Gluten Free, Non GMO, Soy Free and Nut Free. Collagen is the connective tissue in your skin that gives it elasticity, preventing wrinkles and age lines. It’s the ‘glue’ that holds our bodies together and represents about 70% of our body’s skin and connective tissue. Beyond the age of 25, the body's natural collagen levels reduce at a rate of 1.5% per year. This loss can be accelerated by free radicals created through smoking, processed food and ingested toxins. Skin - smooth wrinkles and fine lines, strengthens and rejuvenates, improves elasticity. Hair – Delivers essential nutrients to the hair root, aiding growth, strength, thickness and quality. Hydration – Improves the skins ability to retain moisture. Joints, Tendons and Ligaments and Bones – provides essential nutrients and building blocks to maintain bone strength and tendon flexibility. Nails – strengthens weak, brittle and flaking nails. Acne - Removes toxins that cause inflammation leading to acne and dull lifeless skin. Muscles – Provides amino acids for training and exercise recovery.